As much as you’d love to spend 24-hours a day with your cats, for most, it’s simply not possible. 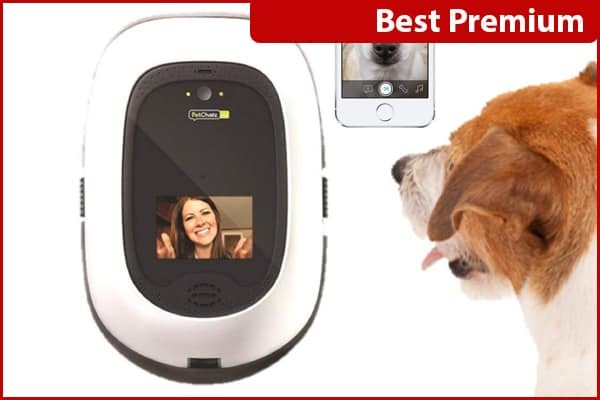 Luckily, several pet camera manufacturers understand the attachment to our pets and have created some great ways to stay in touch while you’re away from home! 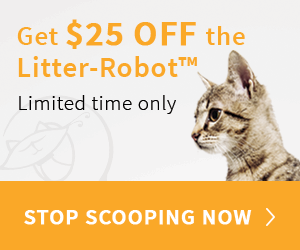 So, whether you just want to peek in on your adorable cat, check to make sure he’s not getting into trouble, or even want to toss a treat and say “hello!” we’ve scoured the market to bring you the Best Pet Cameras for Cats! 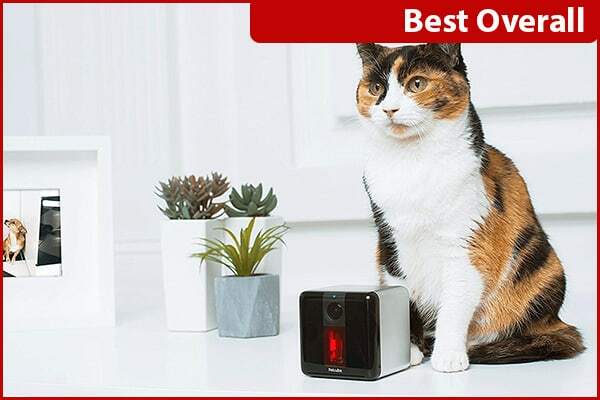 Pros: For our top pick, the Best Overall pet camera for cat owners, we wanted a device that, first and foremost, had great video quality, easy set-up, and user-friendliness. Next, the camera needed to have some cool cat-centric features that made it more than just a camera. And third, it needed to be reliable and an attractive addition to the home. The PetCube Play Wifi Camera checks all the boxes. 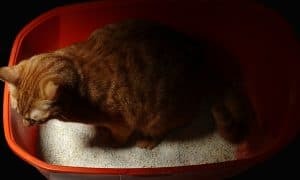 With crisp, clear 1080p high-definition video and night-vision, it’s easy to check-in on your cat day or night from anywhere in the world on your smartphone. Taking it a step further, the PetCube offers two-way audio, allowing you to not only listen in but to talk to your cat, too. And, with sound and motion alerts to your phone, you’ll never miss any of the excitement at home while you’re away. 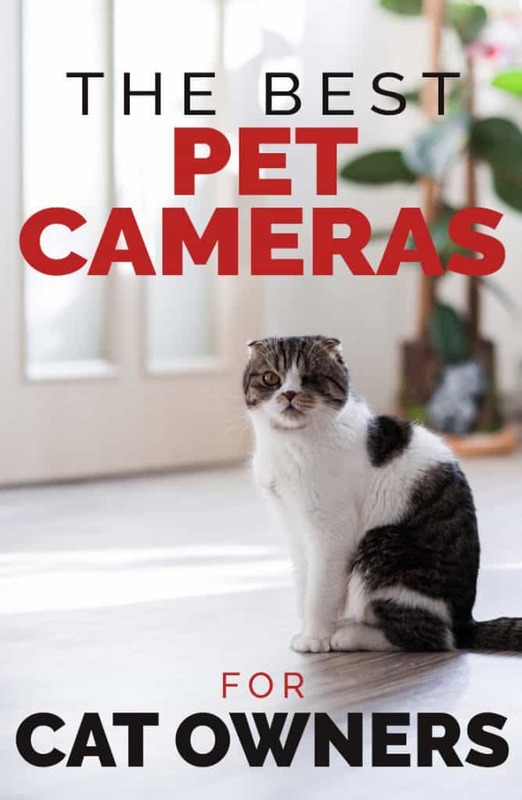 As an added bonus, this pet camera has a built-in laser that you can play live or schedule for auto play, which helps relieve boredom when you aren’t around. 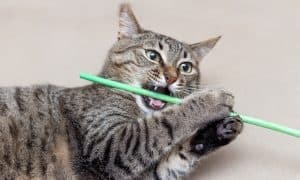 Your cats can play while you’re away! And, with the added ability to keep tabs on both your cat and your home, you’ll enjoy the sense of security that comes with home surveillance. Plus, it comes in black, silver, and rose gold so you’ll have no trouble finding one that seamlessly matches your home’s decor. That doesn’t mean the Yi isn’t without its important features, though! In addition to crisp, clear 1080p high definition, wide-angle video recording that streams seamlessly to your smartphone, the Yi offers infrared night-vision, allowing you to see clearly even in near pitch-black conditions. 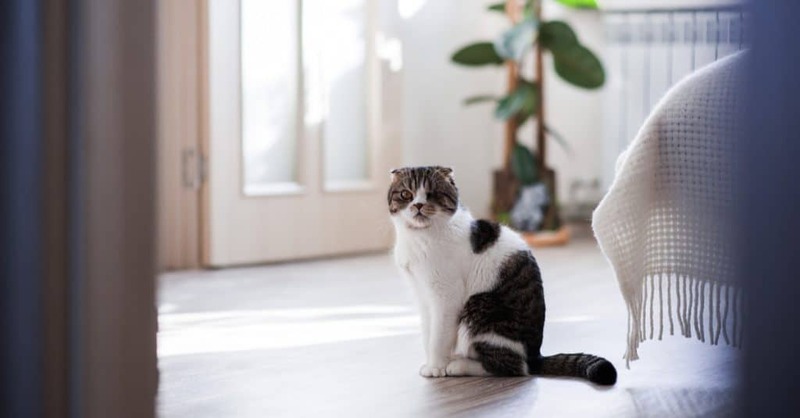 Add two-way audio, allowing you to both hear and speak to your cat, motion/noise alerts sent instantly to your smart device, and the ability to link multiple cameras to a single account and you’ve got an inexpensive, yet totally reliable and solid home and pet monitoring system. Plus, the Yi automatically records and stores several seconds of video (with sound) when motion or noise is detected free of charge. Insert a microSD memory card into the device to store hours of video without the need for a cloud subscription. As I live alone in a managed apartment building, I wanted to install a camera to monitor the inside of my apartment when I am not home. Mainly, I want to be alerted when maintenance or building management enters my apartment for maintenance requests. Additionally, as I have a cat and I sometimes am gone for a night – I wanted to be able to monitor his activity and ensure he’s fairing well. “1. Very easy to set up. It connected without any trouble to my WiFi and was very user-friendly. The app is a breeze. 2. I purchased the micro chip SD card separately so clips are saved beyond the 24 feed (until the card is full and then it will begin to record over itself). 3. It’s very lightweight, so though it is meant to be sat atop a table or shelf, I used the Command Velcro Strips and wall-mounted it for a birds eye view of my apartment. Works like a charm. 4. I like the intercom feature. I am able to talk through it – whether it be to someone inside the apartment or the cat (hey, he gets lonely) and the microphone in the camera can pick up replies as well. 5. My favorite part is that you can choose when you receive alerts. Obviously, when I’m home on the weekend, I don’t want an alert every time I pass in front of the camera so I set it to weekdays only. From there, you can even choose the hours during which you get alerts. So if you work 9am-5pm, you just set it up for those hours and a nifty alert with a 6 second clip of what triggered the alert is available via the app. The PetChatz HD is the ONLY pet camera that offers two-way video, allowing your pets to see you, too! 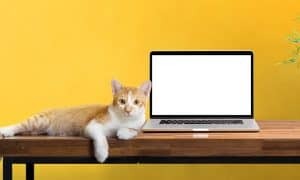 In addition to high definition video, crisp, clear audio, and the ability to dispense treats on demand to your cat, PetChatz even has games and entertainment for your cat to enjoy while you’re away. When you’re not video chatting with your best furry friend, he can lounge in his favorite bed and watch DogTV from his own personal TV screen, mounted right at nose level. And, the PetChatz releases calming aromatherapy scents each time you “call” your cat, easing anxious pets that don’t like being left alone. As an added bonus, PetChatz offers several add-on accessories, including our favorite the PetChatz PawCall, a small paw-print shaped device that allows your pet to call you with the press of a paw! Because there are as many varieties and styles of pet cameras as there are of dogs, no single camera will be perfect for every situation. With that in mind, we couldn’t ignore these notable mentions! 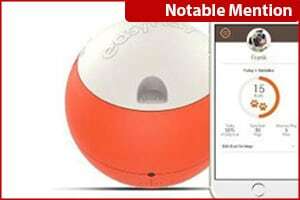 The EasyPlay Robotic Treat Ball is more of a toy than a monitoring or surveillance camera, but we couldn’t leave this off the list. Basically, it’s a treat dispenser puzzle toy that you can control remotely. And, it’s got live video feed, so you can watch (up close and personal from the ball’s eye view) as your cat knocks the ball around to release treats. The EasyPlay is a great way to encourage play while you’re away. And, while your pet must interact with the ball to release the treats, you can “drive” the ball around the room (from anywhere in the world) using the EasyPlay app on your smartphone. Three separate treat compartments you set to a timer mean your clever cat won’t empty to toy in the morning and be done for the day but will be encouraged to play several more times. I need to get a camera for Finn, but I’d be sad to see him crying for me too.